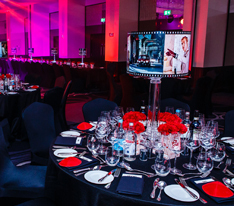 With glittering crystal chandeliers, mascassar ebony wood detail, the finest AV supported by state of the art technology, Grand Ballroom at The Montcalm London is one of the finest London event venues. Holding up to 550 people for stand up reception styled events and 422 for sit down dinners, Grand Ballroom at the Montcalm is situated at the top of Park Lane, by Hyde Park Corner, in the heart of London's West End. The venue has a dedicated street entrance as well as entry via the main lobby of the hotel. Serviced by two grand marble reception areas and blanketed with fresh flowers, this stunning large open, pillar free space benefits from a grand marble staircase escorting guests into the opulent reception and foyer. 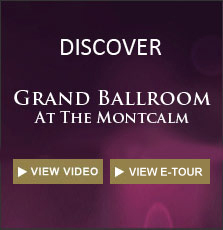 Whether you are looking to hire a meeting room or a luxury wedding hall in London, Grand Ballroom at the Montcalm is the perfect venue for public and private events, ensuring every experience begins with a Grand Occasion.